Raaga.com: Salman Khan fetches Rs 1, 10,000 and Shah Rukh just Rs 10,000/- ? Salman Khan fetches Rs 1, 10,000 and Shah Rukh just Rs 10,000/- ? Two years back Salman Khan fetched Rs 80,000/- but with growing inflation this year his price has boosted to Rs 1 lakh!! Do not get confused we are not talking of actor Salman Khan, rather we are speaking about the goats on sale for Eid-ul-azha (Bakra Eid). In Uttar Pradesh, each year on the eve of Bakri Eid the goat seller have a trend to lure buyers by naming their goats on popular film stars. 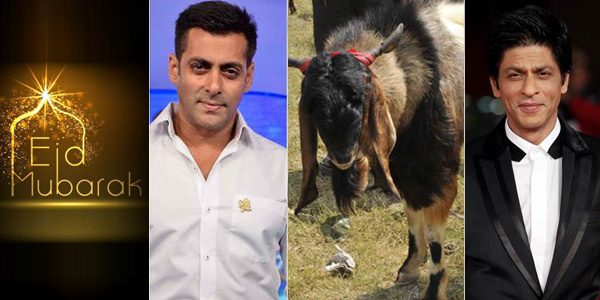 Interestingly while Salman Khan named goad earned Rs 1, 10,000, a goat named Shah Rukh fetched just Rs 10, 000! Interestingly this year besides film star, sports stars too found their place in this goat market. A goat named ‘Sania’, after tennis ace 'Sania Mirza', won a handsome price!! Raaga.Com wishes all our Muslim readers Happy Eid-Ul-Azha!